FUNCTIONAL. UTILITARIAN. MULTIPURPOSE. THOSE ARE THE DESCRIPTIONS THAT MAY COME IMMEDIATELY TO MIND WHEN PEOPLE THINK OF KITCHENS. All those adjectives are appropriate. But for David Hopkins Design, the luxury kitchen — like the other rooms of the house — has to create a balance between function and beauty. Sure, this is where kids may do their homework. It may be where extended family members congregate as they visit during the holidays. It may even be the makeshift “office” for paying bills or catching up on work emails. But none of that means the kitchen can’t — and shouldn’t — have an artistic, eloquent design. In other words, why should the kitchen look like a kitchen? Is it an appliance or a piece of furniture? Is it a TV set or part of an art installation? Why can’t it be both? We look for clever and out-of-the-box ways to “hide” appliances and stack things. This helps create a clean design and gives the room an uncluttered look, while maximizing every inch of space. But we don’t ignore the practical side. It’s important to keep in mind design principles such as the kitchen “triangle” — the sink, oven and refrigerator, which have to create the right flow. Since we love multifunctional features, you’ll find them in every project. In this particular luxury kitchen, the goal was to create a seamless transition to outdoor entertaining. To achieve that goal, several features had to serve the dual purpose of indoor and outdoor living but not look out of place in either. When the glass doors are completely open, it’s as if the outdoors become part of the great room. We placed a second kitchen counter against this door. 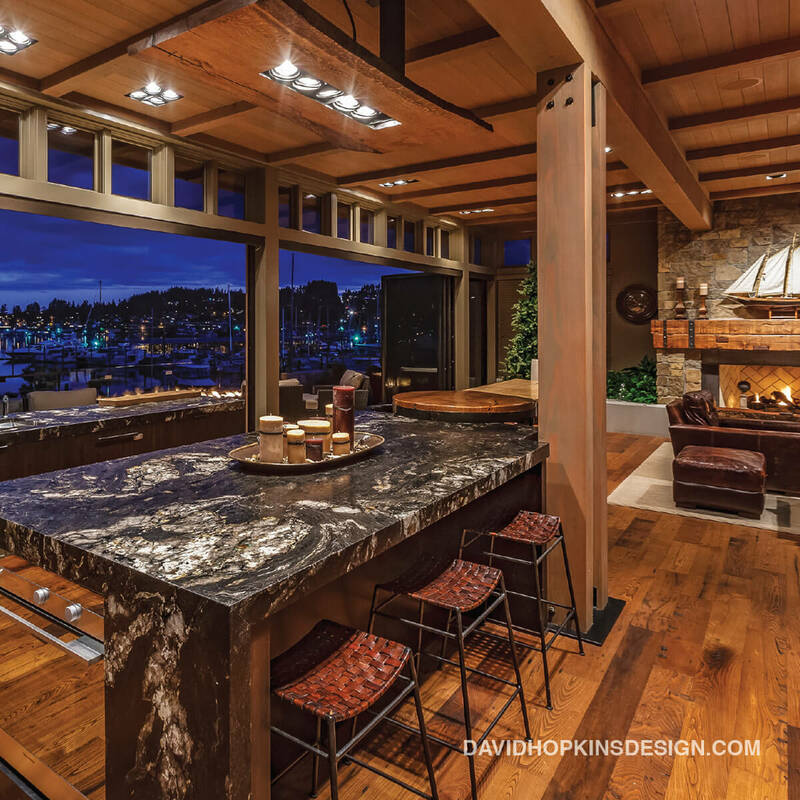 With the door open, the counter becomes an island and guests can sit at the bar on the deck. A TV set (which is concealed under a wood inset by the sink when not in use) swivels either to the indoors or the outdoors, providing the right vantage point for either occasion. The great room has become a common feature in the modern American home, as the tradition of formal dining doesn’t accommodate today’s busy lifestyles. But many home designers view the great room as simply a space that combines the kitchen and the living room into one open area. For us, it’s a lot more than that. Executing the great-room concept in a creative way means making heavy use of elements like five-panel walls, hidden pantries and appliances that blend in. It means the kitchen, like the rest of the home, should feel like a piece of artwork — as well as an inviting, comfortable space for modern living. Luxury kitchen design is a tough challenge. And that’s what we love about it.